Just a quick coda to my earlier post about the debate Megan McArdle and I had over Obamacare and doctor shortages. At one point in our back-and-forth (about 2:35 in) Megan claimed that people would choose not to become doctors if salaries started to fall post-health care reform. The idea was that, unlike other countries, where doctors make up for what they lose in salary with the social prestige of doctoring, in this country we're all about money--social status be damned. I argued in response that the ability to bathe doctors in social prestige isn't exactly a fixed feature of one's national character--it's not that Americans are genetically incapable of it, or that Europeans naturally excel at it. If doctors made slightly less money, but the system were seen as better for patients overall, the social prestige of doctoring might rise a bit and compensate them for the loss of income. We don't have a unified culture. There's no--Sweden can talk about having a Swedish culture, and to some extent a Swedish status hierarchy and Swedish values. That's just not true of America. Everyone's participating in about 97 different subcultures. So you can invent your own status hierarchy, but you can't get everyone to buy into the idea that we should pay our doctors $60,000 a year and then all love them a lot because they're doctors. I guess Megan's point is that Sweden has a more discernible status hierarchy because it's a much more homogeneous country. And it sorta sounds plausible (though I still think most people are inclined to respect doctors regardless of whether or not they belong to the same subculture--all the more so if they're satisfied with their health care). An interesting fact about Sweden is that an extremely high proportion of its population is foreign born. 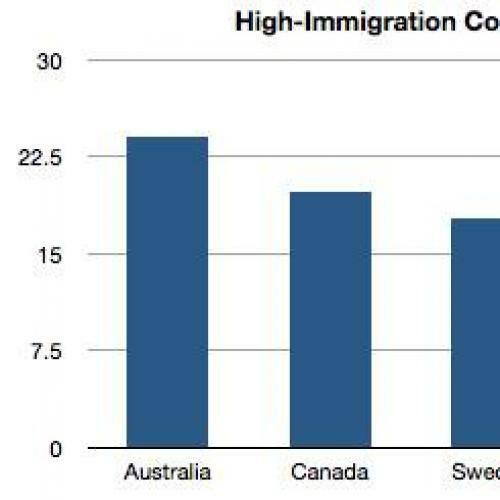 It’s not the highest in the world—Canada and Australia take the crown—but the foreign-born are a larger proportion of the population than in the United States. A large number of those immigrants are from other European countries, but apparently Sweden has one of the world’s largest Assyrian populations. Hmmm. It turns out even Sweden doesn't have a Swedish culture.